Powdery mildew is a fungal disease that results in a powdery gray or white coating on the leaves and stems of infected plants. A powdery mildew infection generally starts out as a few spores on the leaves but quickly spreads. The white powdery surface is a thick coating of the fungi spores. The fungi easily ​overwinters in garden debris, and thus is very hard to eradicate entirely. It can eventually cause yellowing the leaves and premature leaf drop. 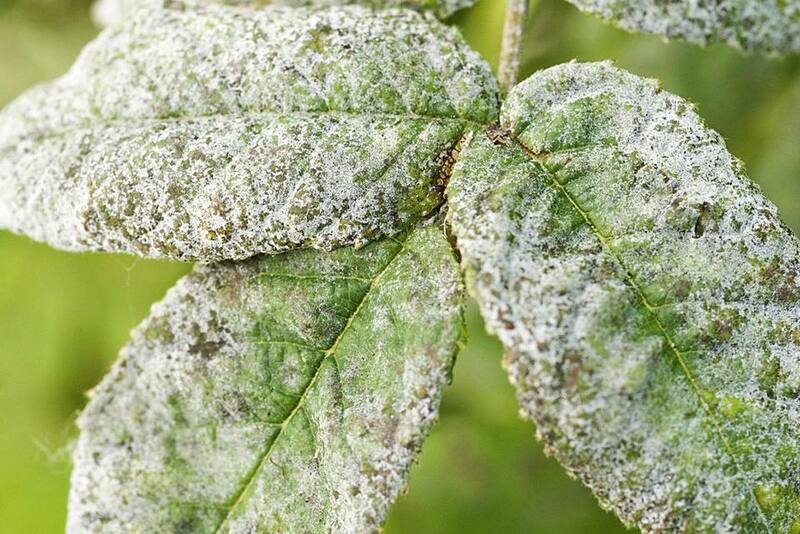 In many cases, powdery mildew does little damage to plants and is merely unattractive. Some plants are so susceptible to powdery mildew that it is virtually unavoidable; you should expect this result if you choose to grow these species. Many gardeners simply resign themselves to the fact that powdery mildew will make an appearance nearly every year and don't bother to fight it aggressively. But besides being unattractive, powdery mildew can, in extreme cases, result in leaf yellowing and dropping; stunted plant growth; distortion of buds, blooms and fruit; and eventual overall weakening of the plant. Spores of powdery mildew overwinter on diseased plant parts and begin asexual production of new spores once the weather warms. New spores are carried on the wind to other parts of the plant or to other nearby plants. Spores never stop producing more spores, so if infected leaves are not destroyed, the problem can never be eradicated and will only get worse. Powdery mildew thrives in temperatures between 60 F and 80 F and particularly during humid weather (but not rainy) and in shady areas with poor air circulation. Chemical fungicides are generally ineffective against powdery mildew; the best strategies are more mechanical in nature, such as simply removing and destroying diseased plants and plant parts. Planting species that are most susceptible in a location where they can receive early morning sun. This will allow condensation and dew to dry quickly and reduce the humid conditions that foster the fungus. Enhancing air circulation by spacing plants well apart. Better ventilation reduces the disease. Dense plants can be thinned out to improve airflow. Inspecting plants regularly during warm, dry conditions, and removing any leaves that show signs of infection. Always destroy (do not compost!) infected plant parts. Applying a spray of 1/4 teaspoon baking soda mixed with 1 quart of water. Spraying plants weekly at the first signs of infection can protect plants against further damage. Applying Neem oil, a commercially available organic treatment. This both treats existing powdery mildew and protects the plant against further infection. Interestingly enough, an effective measure in preventing and treating powdery mildew is to spray the foliage of your plants daily with plain water from the hose. Powdery mildew hates water! The only caveat with this method is to be sure you do it early in the day so that the foliage completely dries before cooler evening temperatures arrive. Otherwise, you might invite other fungal diseases, such as black spot, into your garden.